Austrofascism (German: Austrofaschismus) was the authoritarian rule installed in Austria with the May Constitution of 1934, which ceased with the annexation of the newly founded Federal State of Austria into Nazi Germany in 1938. It was based on a ruling party, the Fatherland Front (Vaterländische Front) and the Heimwehr (Home Guard) paramilitary militia. Leaders were Engelbert Dollfuss and, after Dollfuss's assassination, Kurt Schuschnigg, who were previously politicians of the Christian Social Party, which was quickly integrated into the new movement. Austrofascism, which was Catholic, corporatist and espoused Austrian nationalism, must be contrasted with Austrian National Socialism, which was pan-German in outlook. The Austrofascist movement's origin lies in the Korneuburg Oath, a declaration released by the Christian Social paramilitary organization Heimwehr on 18 May 1930. The declaration condemned both, the "Marxist class struggle", and the economic structures of "liberal-capitalism". Furthermore, it explicitly rejected "the Western democratic parliamentary system and [multi]-party state". The declaration was directed mainly at the Social Democratic opposition, largely in response to the Linz Program of 1926, and was not only taken by the Heimwehr but also by many Christian Social politicians, setting Austria on a course to an authoritarian system. Ideologically, Austrofascism was partly based on a fusion of Italian fascism, as expounded by Giovanni Gentile, and Austria's Political Catholicism. Flag of the Fatherland Front of Austria. The election in Vienna in 1932 made it likely that the coalition of Christian Social Party, the Landbund, and the Heimwehr would lose their majority in the national parliament, depriving the Dollfuss government of its parliamentary basis. To prevent its loss of power, the government sought to replace Austrian democracy with an authoritarian system. These efforts were supported from abroad by Benito Mussolini. The opportunity for such a transition arrived on 4 March 1933 when the national parliament was paralysed by procedural disputes. Dolfuss held a one-vote majority in parliament; During a dispute over a voting recount, the speaker and vice-speakers of parliament resigned in order to be able to cast their votes, and in the absence of the three speakers, there existed no procedural means to reconvene Parliament. Dollfuss branded this as the "self-elimination of the Parliament" and proceeded to rule on the basis of the Wartime Economy Authority Law. This law had been passed in 1917 during World War I to enable the government to issue decrees ensuring the supply of necessities. The law had never been explicitly revoked and was now used by the Dollfuss government to inaugurate an authoritarian state. On 7 March 1933 the Council of Ministers issued a ban on assembly and protests. Press regulations were also levied by the Wartime Economy Authority Law and touted as economic safeguards. The law allowed for the government to require approval of a newspaper which had already been printed up to two hours before its distribution under certain circumstances, for instance if "through damage to patriotic, religious or moral sensibility, a danger to public peace, order and security" would arise. This allowed for censorship of the press, but the government was eager to avoid the appearance of open censorship, which was forbidden by the constitution. The opposition made a final attempt to reverse the changes in parliament, which was met by police power on 15 March 1933. As Großdeutsche, who advocated a merger with Germany, and Social Democrats arrived at the Parliament building, the government sent 200 detectives to the Parliament to prevent the representatives from taking their places in the assembly hall. On 31 March the government dissolved the Republican Schutzbund. On 10 April 1933 the "Glöckel-Erlass", authored by former Social Democratic Education Minister Otto Glöckel, was abolished; the new law made participation in Catholic lessons in schools mandatory. On 10 May, all federal, state and local elections were cancelled. The Communist Party of Austria was dissolved on 26 May, the National Socialist Workers' Party (NSDAP) on 19 June, and the Free Thinkers Guild on 20 June. The Hotel Schiff, an asylum of the Social Democrats in Linz, was raided by the police in February 1934. The Social Democrats resisted, leading to the Austrian Civil War, which was quelled with military and paramilitary force. Afterward, the Social Democratic Party was banned in Austria. On 30 April 1934 the national parliament, in its last session, passed a law that authorised the government with all the powers previously held by parliament. For more details on Austrian Civil War, see July Putsch. For more details on the structure of the state, see Federal State of Austria. On 1 May, Dollfuss' government proclaimed the May Constitution (Maiverfassung), which diminished the term Republic and instead used as the official name of the state "Federal State of Austria" (Bundesstaat Österreich), though the constitution actually reduced the individual states' autonomy. The Federal Council was retained, though only as a significantly limited check on the Federal government. Rather than establishing the composition of a fifty-nine member National Council through direct suffrage, this was accomplished by four "Councils" representing the professionals from Austrian Culture, State affairs, the States of Austria (Länder) and Economic affairs (the latter elected by seven corporations supposedly representing workers and employers). The National Council lost its power to initiate legislation but was still expected to approve decrees from the government. All essential power lay with the Federal Chancellor (Bundeskanzler), who appointed his government single-handedly, and the Federal President (Bundespräsident), who named the Chancellor. As with Antonio de Salazar's 1933 constitution (and the Estado Novo regime in whole), the Maiverfassung promoted a Catholic corporatism which bore a strong resemblance to the principles outlined in Quadragesimo anno, rejecting capitalism and socialism. Chancellor Dollfuss was killed in July 1934, during an attempt by Austria's National Socialist Party to topple the regime and proclaim a Nazi government under Ambassador to Rome Anton Rintelen. The assassination of Dollfuss was accompanied by Nazi uprisings in many regions in Austria, resulting in further deaths. In Carinthia a large contingent of northern German Nazis tried to grab power but were subdued by the loyalist Heimwehr units. The Nazi assassins holding the Federal Chancellery Vienna surrendered after threats to dynamite the building and were executed before the end of July. While Heimwehr leader Starhemberg briefly assumed power as Vice Chancellor, Kurt Schuschnigg was appointed Dollfuss' successor by President Miklas on 29 July, ousting Starhemberg from the government completely in 1936, before surrendering to Nazi pressure in March 1938. One of the reasons for the failure of the putsch was Italian intervention: Mussolini assembled an army corps of four divisions on the Austrian border and threatened Hitler with a war with Italy in the event of a German invasion of Austria as originally planned, should the coup have been more successful. Support for the Nazi movement in Austria was surpassed only by that in Germany, allegedly amounting to 75% in some areas. The Fatherland Front (German: Vaterländische Front, VF) was the ruling political organisation of “Austrofascism”. It claimed to be a nonpartisan movement, and aimed to unite all the people of Austria, overcoming political and social divisions. Established on 20 May 1933 by Christian Social Chancellor Engelbert Dollfuss as a single party along the lines of Italian Fascism, it advocated Austrian nationalism and independence from Nazi Germany on the basis of protecting Austria’s Catholic religious identity from what they considered a Protestant-dominated German state. Austrofascism’s ideology of the “community of the people” (Volksgemeinschaft) was different from that of the National Socialists. They were similar in that both served to attack the idea of a class struggle by accusing leftism of destroying individuality, and thus help usher in a totalitarian state. Dollfuß claimed he wanted to "over-Hitler" (überhitlern) National Socialism. Austrofascism, however, focused on the history of Austria. The Catholic Church played a large role in the Austrofascist definition of Austrian history and identity, which served to alienate German culture. According to this philosophy, Austrians were "better Germans" (by this time, the majority of the German population was Protestant) and that Austria was a second German state but the "better German state". The monarchy was elevated to the ideal of a powerful and far-reaching state, a status which Austria lost after the Treaty of Saint-Germain. After the parliament was dissolved, the government also dissolved the Constitutional Court (Verfassungsgerichtshof). The four Christian Social members of the Constitutional Court had resigned, and the government banned the nomination of new judges, effectively closing the court. In September 1933 the government established internment camps for political opposition members. Social Democrats, Socialists, Communists, and Anarchists were all considered dissidents condemned to internment. After the July Putsch of 1934, National Socialists were also regularly interned. On 11 November 1933 the government reinstated the death penalty for the crimes of murder, arson, and “public violence through malicious damage to others’ property”. In February 1934, rioting (Aufruhr) was added to the list of capital offenses. Judges were instructed that, if they did not pass down a death penalty verdict within three days, they would be removed from the case and it would be brought to a jury trial. But—and it was an important 'but'—the terror never reached anything like the repressive force of the Nazi terror. Most of those arrested promptly got out of jail again. Even at its most extreme phase, it was difficult to take the Schuschnigg dictatorship completely seriously. This was because of Austrian gentleness, Austrian genius for compromise, Austrian love for cloudy legal abstractions, and Austrian Schlamperei. By 1933 a series of laws had already been passed to bring the educational system in Austria into line with Austrofascism. The Catholic Church was, under the new government, able to exert significant influence on educational policy, which had previously been secularised. In order to pass the Matura (the test required for graduation), a student had to have taken religious education classes. Educational opportunities for women were significantly limited under the new regime. Post-secondary education was also targeted by the new regime. The number of professors and assistants fell as the government produced legal grounds for deposing those who were critical of the new regime. Disciplinary actions, previously the responsibility of individual universities, were relegated to the government. Only members of the Fatherland Front were allowed to become university officials. By 1930, foreign trade to and from Austria moved away from a free market system and became an extension of the autocratic government. Chief among the changes was the closing of the Austrian market to foreign trade in response to the New York stock exchange crisis in 1929. Unemployment grew drastically, between 1932 and 1933 by over 25 percent. In response, the government removed unemployment benefits from the national budget. Additionally, the government created the so-called “Cooperations’ of workers and enterprises charged with undermining workers’ movements. International trade was restricted and eventually banned. There was no official policy of antisemitism between 1933 and 1938. Public violence against Jews was rare. As the Austrofascist state saw itself under the growing pressure by Nazi Germany which penalized its citizens who travelled to Austria with a 1000 Mark fee, and even more so after the failed Nazi coup against the Austrian government in July 1934, many Jews supported the regime. Austrofascist officials supported the Salzburg Festival which employed famous Jewish artists like Herbert Graf, Alexander Moissi, Max Reinhardt, Richard Tauber, Margarete Wallmann, and Bruno Walter. Walter also was a leading conductor for the Vienna State Opera until 1938 and conducted several concerts given by the Vienna Philharmonic Orchestra. Therefore, the festival was harshly criticised by German officials and boycotted by German artists like Richard Strauss, Wilhelm Furtwängler, and Clemens Krauss. The Festival also came under attack by Austrian antisemites and exponents of right-wing parties. Many Jews fled Germany and found a temporary refuge in Austria. Artists like filmmaker Henry Koster and producer Joe Pasternak could not work in Germany any longer and continued to produce films in Austria. Vienna's Theater in der Josefstadt provided many Jewish actors, playwrights and directors with the opportunity to continue their work, among them Reinhardt, Albert Bassermann, Egon Friedell, Hans Jaray, Otto Preminger (the theater's managing director until 1935), Ernst Lothar (managing director until 1938), and Franz Werfel. Jewish athletes made the SC Hakoah Wien one of the most successful athletic clubs in Austria before 1938. Its athletes excelled on many occasions throughout Europe. Yet there was a purge of public offices, and many Jews were fired from their posts on the accusations that they were Communist or Social-Democratic sympathizers. There were occasional outbursts of Antisemitism in right-wing newspapers. However, Jews continued to be an integral part of Austrian society until March 1938. But some of them lost their hopes for a fruitful future and left Austria before 1938, especially following the Juliabkommen 1936 between Austria and Germany which provided an amnesty for illegal Nazis. Among the most prominent Jews who left Austria before 1938 were Stefan Zweig and Otto Preminger. The regime lasted as long as the favour of Fascist Italy under Mussolini protected it against the expansionist aims of Nazi Germany. However, when Mussolini sought to end Italy's own increasing international isolation by forming an alliance with Hitler in 1938, Austria was left alone to face increasing German pressure. To protect Austria's independence, Schuschnigg reached an agreement with Hitler under which 17,000 Austrian Nazis received amnesty and were integrated into the fold of the Fatherland Front. Arthur Seyß-Inquart, the leader of the Austrian Nazis, was appointed Minister of the Interior and Security. As Nazi pressure continued, now supported from within the government, Schuschnigg tried to rally popular support for Austria's independence by a referendum. Hitler reacted by alleging an attempt at a fraudulent vote and demanded that Schuschnigg should hand over the government to the Austrian Nazis or face invasion. Schuschnigg, unable to find support in France or Great Britain, resigned to avoid bloodshed. After an interlude, in which Nazis had gained control of Vienna, President Miklas, who had at first refused, appointed Seyß-Inquart Chancellor, who then requested military occupation by the German army. The next day, Hitler entered Austria and declared it a part of the German Reich, which was subsequently formalized on March 15. Although the term "Austrofascism" was used by the proponents of the regime itself, it is still disputed today. Both Dollfuss and Schuschnigg also favoured Christlicher Ständestaat and Fuehrerstaat. Austrofascism is often used by left-wing historians, while conservative historians prefer the term Ständestaat. Other historians simply use "Dollfuss–Schuschnigg" for the authoritarian regime, after its two rulers. On a political level, criticism sometimes comes from representatives of the Austrian People's Party (ÖVP; the post-World War II successors of the Christian Social Party), some of whom do not distance themselves from the authoritarian Austrian regime of the Patriotic Front. They usually stress the Austro-fascists' merits in fighting for Austria's independence and against Nazism. While it is undisputed that the regime was an authoritarian dictatorship in character (it locked away members of the opposition, mostly Communists, Social-Democrats and later Nazis, in concentration camps called Anhaltelager or imprisonment centers), some historians argue that it lacked certain characteristics of true fascism. 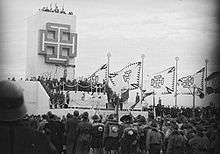 Although the Fatherland Front used fascist-like symbols (such as the Kruckenkreuz) and was meant to be a party of the masses, it lacked a solid basis in the population, especially among labourers who tended to support the Communists or the Nazis. The Austrian government also did not target minorities or engage in any sort of expansionism. According to some historians, Austrofascism was a contrived and desperate attempt to "out-Hitler" ("überhitlern") the Nazis, a term used by Dollfuss himself. They argue that Dollfuss was interested in a renaissance of Catholicism rather than in a totalitarian state, meaning that he wanted to return to the time before the ideas of the French Revolution of 1789 took hold. Ernst Hanisch, for example, speaks of semi-fascism. Some parallels to Spain under Francisco Franco cannot be overlooked, however. Austrofascism is sometimes also called imitation fascism. ↑ "AUSTRIA: Eve of Renewal". 25 September 1933 – via www.time.com. ↑ Ryschka, Birgit (1 January 2008). "Constructing and Deconstructing National Identity: Dramatic Discourse in Tom Murphy's The Patriot Game and Felix Mitterer's In Der Löwengrube". Peter Lang – via Google Books. 1 2 Gunther, John (1936). Inside Europe. Harper & Brothers. p. 317. 1 2 Botz 2014, p. 121. Botz, Gerhard (2014). In: António Costa Pinto and Aristotle Kallis (Eds.). "The Coming of the Dollfuss-Schuschnigg Regime and the Stages of its Development". Rethinking Fascism and Dictatorship in Europe: 121–153. ISBN 978-1-349-48088-3. (German) Andreas Novak: Salzburg hört Hitler atmen: Die Salzburger Festspiele 1933–1944. DVA, Stuttgart 2005, ISBN 3-421-05883-0.